please add the domain "texascooking.com" (not the entire "from" address, which may vary) to your Safe List. Drawing for Win 2.75 Carat Emerald Tennis Bracelet - 7" ($150 retail). St. Patrick's Day Dinner The first time I made this dish was during the run up to St. Patrick's Day. I had no previous experience with Guinness, either in cooking or drinking, and I was eager to see how it would combine with the beef. I wasn't disappointed, nor will you be. I cannot emphasize enough how good this smells while it's cooking. The Guinness adds a yeasty aroma, so it smells like you're cooking beef and baking bread at the same time. March is right around the corner, and it's National Celery Month. Celery is a winter crop, and available fresh from Texas growers between December to April. It's extremely healthful. You can munch on a plain old celery rib, put it in a salad or add it to innumerable soups and stews. See also our recipe for homemade chicken pot pie. You are reading our Recipe of the Week newsletter. In 2014 our main monthly newsletter will feature brand new recipes that we add to the TexasCooking.com website. If you do not already receive our monthly newsletter, subscribe here. This is such a good dish. The Guinness manifests itself loud and clear both in flavor and aroma. 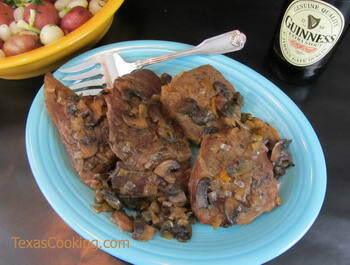 Beef, onions, mushrooms and Guinness -- a terrific combination. I purchased a large bottle of Guinness (1 pint 6 ounces) and used almost all of it. The size of your baking dish will have a lot to do with how much you need. Also, don't try to enhance the recipe by using sirloin or eye of round. Ordinary round steak will give the best result. Trim excess fat from steak, and slash edges to prevent curling. In a skillet over medium-high heat, quickly brown the steak pieces in 2 tablespoons of the oil. Remove from skillet and set aside. Lower heat to medium. Add the sliced mushrooms and chopped onion to the skillet along with the remaining 1 tablespoon oil and butter, and sauté until onion is transparent. Spread the sautéed vegetables evenly in a baking dish large enough to accommodate the steak in a single layer. Place steak pieces over the vegetables. Slowly pour the Guinness into the pan until steak pieces are just barely covered. Sprinkle in the thyme and orange peel, if using, and season well with salt and pepper. Right around the corner! Houston Livestock Show and Rodeo March 4 through 23 at Reliant Park. BEAUTY AWAITS in Houston, opening on March 2, John Singer Sargent: The Watercolors. Happening around Texas this weekend: Borderfest in Hidalgo (March 6-9), OysterFest in Fulton. If you're in Austin this weekend and not part of South By Southwest, just leave. You can't get anywhere or do anything. New in the book pile: Texas Adoption Activist Edna Gladney: A Life and Legacy of Love by Sherrie McLeroy, the story of one Texas woman's work for children's rights and adoption reform alongside the making of the 1941 Greer Garson movie Blossoms in the Dust. The Travis Club by Mark Louis Rybczyk, the author of the wonderful San Antonio Uncovered creates his first work of fiction - about a young writer in San Antonio who pens obscure historical guidebooks! Texas Then & Now (Hardcover) by William Dylan Powell & Ken Fitzgerald, this book is beautiful -> Between Heaven and Texas (Hardcover) photographs from the late Wyman Meinzer. Serve food on colorful Fiesta dishes. Manufactured in the USA since 1871. See the newest color lapis. Grandma's Cookbook contains more than 700 kitchen tested (and time tested) recipes. It's your online cookbook. Texas Cooking's monthly newsletter showcases new articles, reviews and recipes on the site. Follow our columns about cooking, Texas trivia and other Texas news as well in this informative email. ©2014 Texas Cooking. All rights reserved.